Getting our required daily nutrients is often hard to achieve when we rely on only food sources. It is for just that reason that you can now supply your body with all of the dietary, heart healthy, elements that need to be replenished on a daily basis. The powerful antioxidants in Complete Essentials with IsaGenesis are an ideal way for your body to diminish the damaging effects of free radicals, which play a major part in the ageing process. Complete Essentials with IsaGenesis is more than a one size fits all daily supplemental. There is one selection exclusively formulated for the male body and one for the female body. The reasoning behind the development of explicit daily supplements is to provide both sexes with the optimum benefits needed for their physical, mental, and cardiovascular well-being. What’s Included in Each Daily Pack? Our bodies are complicated. They require a lot of nutrients to function at peak performance, and it can be difficult to get everything you need from food alone. Complete Essentials with IsaGenesis are daily supplements that help to round out your diet and maintain full body health. In these powerful supplements, you’ll get a unique blend of high-potency vitamins, minerals, antioxidants, and omega-3 fatty acids to keep your body healthy, fight off the effects of free radicals, and promote heart and brain health. Every package of Complete Essentials gives you the ideal balance of nutrients to sustain a healthy lifestyle. You’ll get vitamins and minerals such as calcium, magnesium, zinc, and iodine to keep your body functioning at peak performance. This is in addition to the antioxidants to fight the aging effects of free radicals and the important benefits of Omega-3s. With Complete Essentials, you’ll get your vitamins and minerals pre-packaged, so you know you’ll always get everything you need in one convenient serving. The nutrients are divided into AM and PM packs for each day. This is to ensure that your body absorbs the nutrients in the most efficient way. You can also choose a Men’s or Women’s system to customize the nutrients to your body’s specific needs. Everything in your Complete Essentials pack has been tested to make sure that it is pure, safe, and effective. Isagenix is all about cleansing your body of things that are harmful or just unnecessary. All products are independently evaluated to make sure that you get the absolute best! Supplying your body with all of the necessary components for a healthy lifestyle has never been easier. Each box of Complete Essentials with IsaGenesis has an entire month’s supply of time-released morning and evening supplements. The packets are marked for AM and PM, so there is never any confusion. In addition to being effortless in their go-anywhere packets, the dosages are formulated to give your body its wake-up nutrients in the morning and its sustaining nutrients in the evening. You no longer need to purchase a variety of individual supplements nor need to take a handful of tablets every day. 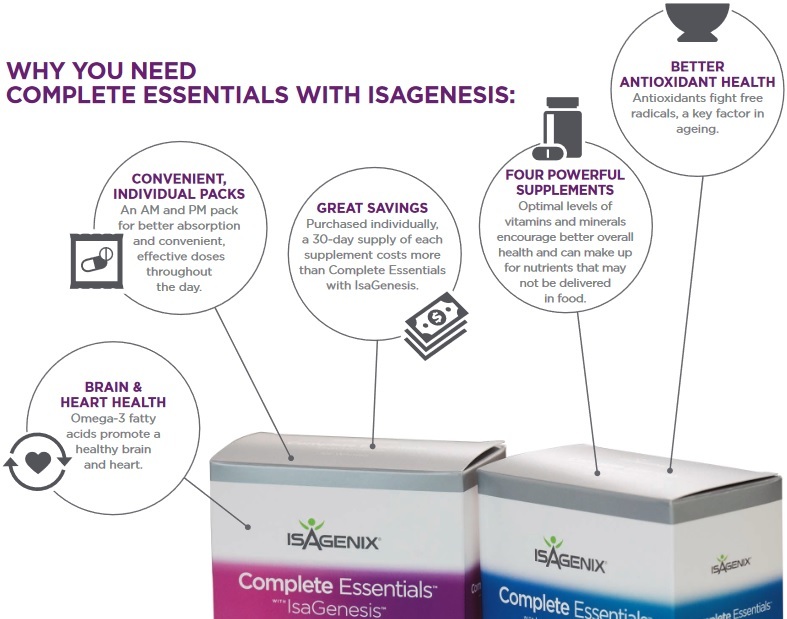 Complete Essentials with IsaGenesis means that there is no guess work involved because we did the research and put it all in two daily packets for you. Healthy maintenance has never been easier. The purity and safety of all ingredients in every dosage of Complete Essentials with IsaGenesis have been thoroughly tested, studied, and evaluated by independent nutritional and pharmaceutical laboratories. Isagenix continually strives to provide you with products that go beyond the industry standards for quality manufacturing by including a finished safety verification. We firmly believe that there is never a reason to compromise on integrity and that you deserve the absolute best product available on the open market. 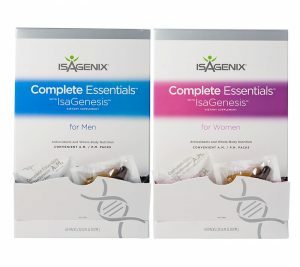 As with all of your favourite Isagenix products, Complete Essentials with IsaGenesis is available from the Back Office. We are confident that once you try Complete Essentials and feel the difference in your energy level and your ability to handle both routine and stressful situations with a calm approach, you will want to include these supplements on your Autoship order.